Grade Seven students enjoying a moment with their job well done! 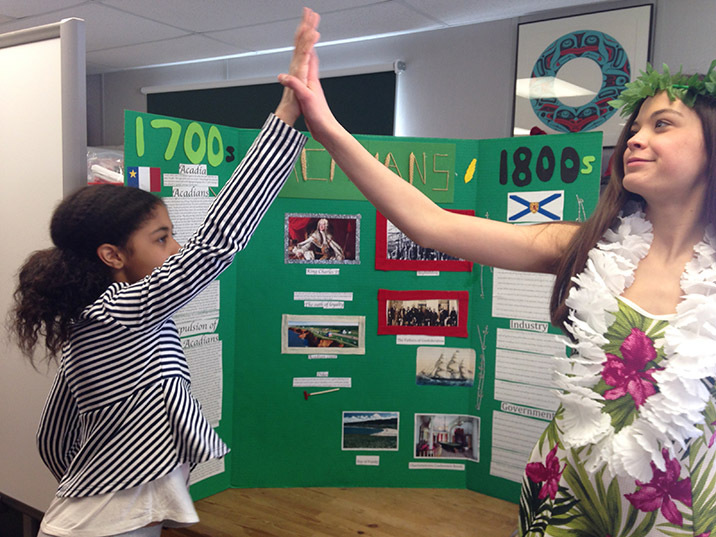 These girls are feeling great after completing their presentation on Nova Scotia and the Acadians. And after such an intensive study and research period, they have earned it! Our Junior High program is made up of several 6 – 8 week sessions over the year. Each session focuses on a different inter-curricular theme, and encompasses studies from all subject areas. On top of related lessons, weekly work and field trips, students are responsible for identifying an area of interest within a topic and completing a major research project with a written, oral and creative component to it. With all of this rigorous behind them, our students are understandably proud of their accomplishments! There are numerous arguments in favour of “teaching by topic” instead of “teaching by subject” in order to really prepare students for life. So many in fact, that the entire country of Finland – one of the world’s most successful education systems, is making the switch. Check out the article below for more information. 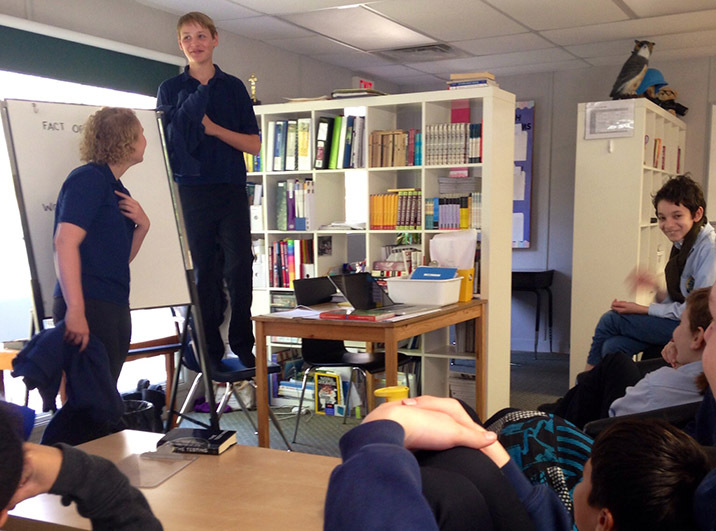 Pictured above, the Junior High students are acting out the famous balcony scene from Romeo & Juliet as part of their Shakespeare studies, as well as playing the part of the Founding Fathers of Confederation in their session work. Our Junior High students can often be found enjoying themselves through active games, role play, and group work. Current research shows that keeping play, creativity, and joy in the classroom helps to drastically reduce mental health problems like depression and anxiety in teens, as outlined in the following article in Time Magazine. More than 100 years ago Dr. Montessori also recognized the importance of “role – play” for adolescents. Around age 12 students enter into their third plane of development, entering a period in which their focus switches from mental to social independence. During this time students are using all of their prior knowledge to form themselves. As they develop, they begin to query who they are as a person and how they fit into society. All of this questioning requires adolescents to try on different roles in order to see how they fit. This is just some of the internal work of teens. Luckily, our teachers understand how this critical formation period works and have set up a program that takes their stage of development into consideration, helping them not only advance in their academic studies, but have fun at it too! For those unfamiliar with Montessori, walking into one of our classrooms can seem a little overwhelming at first. 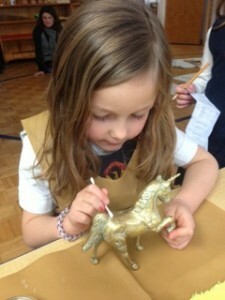 Unlike traditional schools, a typical scene in our classes includes a huge array of activity. You are likely to observe a scattering of kids; some working at tables around the room, others spread out with mats on the floor, a teacher in a lesson with a handful of students, and if it is after 10am then you can add a couple of students at the snack table. All of these students might be working on entirely different things, and to those of us brought up in rows of desks staring at the teacher, this scene can even feel a little chaotic! There are many built in mechanisms that allow this seemingly disorganized system to far outperform its traditional counterpart. Top among them is our use of movement and tactile materials in the class. Dr. Montessori recognized that children need to move and touch in order to really internalize their learning. (Anyone who has ever had a toddler can substantiate this!). She developed brilliant materials in all subject areas that allow students to really experience the concepts they are learning about. Children naturally love exploring with their hands, and often our students are enjoying using the Montessori Materials so much that they don’t even realize that they are learning an academic concept. The materials are designed to be self-correcting, so that students are able to check themselves if they are completing their work correctly. All of this makes it possible for members of the class to be working on different things at the same time. Check out the article below to see what recent science is saying about movement and materials in the class. Over the past five decades our teachers can attest to the same findings! When my daughter first started in Casa and came home talking about polishing silver, I have to admit that I had a few hesitations. ‘How outdated is this curriculum? Is this really how she is spending her morning at school?’ It wasn’t until I started training as a Montessori teacher that I really understood the true value of many of the practical life activities, proficiencies that reach far beyond the ability to help polish the silverware before Grandma’s annual visit for the holidays. There is no doubt that silver polishing was a more readily required skill 100 years ago when Dr. Montessori first designed the preschool curriculum. While I thought it was great the kids were learning useful skills like washing tables and taking care of plants, I wondered why they didn’t just remove the whole antiquated polishing practice and replace it with a more up to date skill; online banking perhaps? It turns out that Dr. Montessori had hidden intentions when creating many parts of the curriculum, especially in the practical life department. Children love working on concrete skills; they savor the opportunity to complete a ‘real’ job independently. Polishing activities also reinforce the importance of showing respect for your things; not just throwing something out when it gets a little old (perhaps an increasingly important lesson in our disposable culture!). However, more then this, Montessori recognized that in each task there is a chance to capitalize on academic skills as well. These underlying components of each lesson are referred to as the ‘indirect aims’. Within the polishing work, ancillary goals include working on fine motor skills and strengthening the pincer grip, which are necessary for the many pencil tasks ahead in their schooling career. Students are also taught to remember and follow multiple steps in the process, a prerequisite for future math work. If that wasn’t enough, to trump all of these reasons, there is also the inner-satisfaction the child feels when they complete a piece of work independently, increasing their ability to concentrate and boosting their self-confidence. So the next time you feel concerned that your child is spending so much time on practical life skills you can relax; the hidden aims they are completing are setting them up for success in future academic work. Needless to say the Casa classes at Dearcroft now have a supply of my previously tarnished silver, and I am happy that it is actually being used and appreciated somewhere! Parents new to Montessori often question the multi-age groupings found in our classes. “Will my child have enough friends? Will they cover the entire curriculum for their grade level? Can the teachers keep track of it all?” For each question asked there are even more answers as to why children benefit from this system. It allows them to learn from each other, to have multiple mentors, to become leaders themselves building their confidence, and to develop a deep connection with their teachers, just to name a few. The true magic of these multi-age groups is always more evident on the trips we take, as it was on our most recent trek up to Haliburton with our grade 4 through 8 students. “Your students are so supportive of each other. How do you guys do it?” began the conversation between the program guides and teachers over dinner the first evening. The resulting reflection encompassed many things, however, agreement kept centering on the multi-age groups. When kids of different ages are together in a group they look after one another in a way that just isn’t present in groups of all the same age. Younger ones look up to the older ones. They work hard to be mature like their older counterparts and enjoy the attention from them. Experienced students keep a protective eye on the younger ones, and relish in the chance to be in the spotlight. The result is a caring community where students feel supported to be who they are. In and out of the class, the benefits of the multi-age grouping are clear on a daily basis to the staff working with the students. The program instructors from the trip are arranging a visit to Dearcroft because they were so impressed by the group work and support they saw in the children. We are lucky to say it is the norm for us to hear such compliments about our students when we are out on trips, something we credit in large part to the multi-age groups found in Montessori classes.